We love our town, and we’re pretty certain you will too! 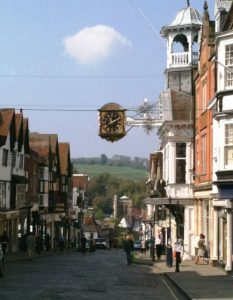 From the picture-postcard cobbled High Street (the cobbles are actually called 'setts', you know) to the enticing narrow lanes of Chapel Street and Swan Lane; from the 15th Century Guildhall to top of the range designer shops; Guildford has something for everyone...and only 35 mins from London! Presenting pre- and post- West End tours of new and classic plays, regional tours, and of course their renown home-grown pantomime every Christmas. Check out the Riverview Cafe and Late Night Tapas Bar! Guildford Museum is housed in beautiful, historic buildings next to the Castle Grounds. The exhibitions are free to visit and include a variety of changing exhibitions, plus a permanent collection of objects dating from prehistoric times. Including a permanent exhibition of Lewis Carroll in Guildford. The cornerstone of Guildford's heritage, the 1000 year old St Mary's Church is a veritable aladdin's cave of history: from grotesque corbels (look 'em up, then look up!) to pilgrim passages to Lewis Carroll's pulpit, St Mary's is not to be missed. Watts Gallery – Artists' Village is a unique art gallery and heritage site nestled in the Surrey Hills just ten minutes from Guildford. Special events, creative workshops and a world-class exhibition programme run throughout the year. Did you know Watts played host to our promenade production of The Wind in the Willows in 2015? Sitting opposite Guildford Castle (hence the name!) The Keep is a lovely bare-beam and brickwork pub offering real ales and a fabulous gin menu, plus live folk acts and comfort food. What's not to like?! Another popular haunt for GSC casts and audiences, the locally known 'Brit' has an enviable position overlooking the River Wey, and if you're on a walk with a dog they've even got a range of beds for your four-legged friend to choose from! This fabulous family-run Italian restaurant is hidden above the High Street through an intriguing little red door. Inside you'll discover an Elizabethan building that’s bursting with character: dark-wood panels, original beams, clean white tables and some of the best Italian food this side of Naples!